With the third game in the series, Batman: Arkham Origins still on the shelves, Rocksteady Studios announces the explosive, final game in the series Batman: Arkham Knight due out this year! In Batman: Arkham Knight, Batman is up against the greatest threat to Gotham City to date. The Scarecrow is back, along with Penguin, Harley Quinn and Two-Face with a plan to dispose of Batman FOREVER. 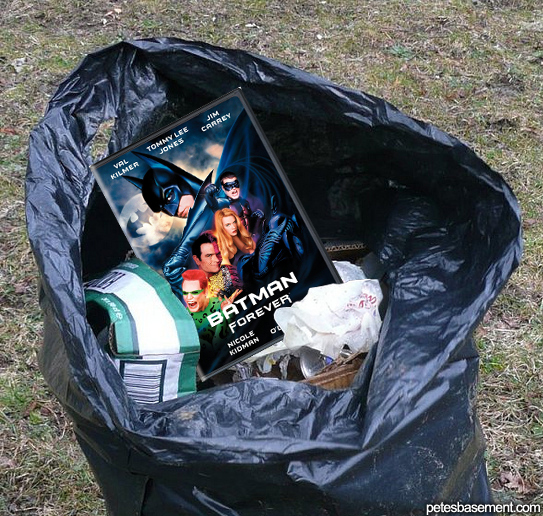 (I already disposed of Batman Forever a long time ago). I also heard a rumor that HUSH is going to be in it. That's SWEET. Check out the official trailer below. Is it me, or did they kinda make Bruce Wayne look like Ben Affleck? HEH! I haven't even played Batman: Arkham Origins yet (I gets games used and cheap, sue me) and they're already getting me hot and bothered for the next one. Unfortunately for me, and everyone else who isn't on board with next gen consoles, only those with an XBOX One, a PS4 or a PC will be getting this game. Kevin Conroy will be returning as the voice of Batman in this boombastic finale to the Arkham series. Kevin Conroy was the voice of Batman from the original animated series, as well as several cartoon movies and games. He was the first person to give Bruce Wayne a different voice from Batman, and he's sitll my favorite! 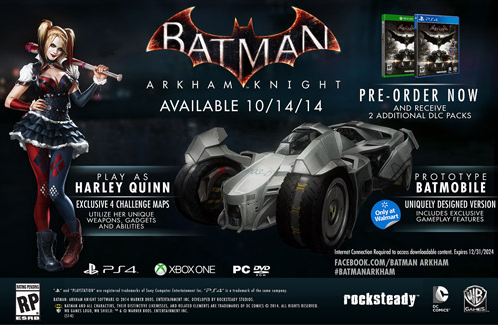 Arkham Knight introduces a new snazzy feature unseen in all of the previous games, A DRIVEABLE BATMOBILE! It's tumbler style. Tell me I can run over thugs, and it's on. Considering we had to upgrade moves and gadgets in the last game, I wonder if the Batmobile will have to be upgraded to awesomeness as well. The Batmobile is going to be a core element of the game, which means a bigger map, and larger streets to accommodate the vehicle. Many retailers are going to offer pre-order bonuses to compete for your love. As of now, Gamestop is offering Harley Quinn as a playable character including 4 exclusive challenge maps, plus a Batman 75th Anniversary collage poster when you pre-order for XBOX ONE , PS4 , and PC . Gamestop is also offering a coupon for 10% off purchases of $79 or more. Not including consoles. 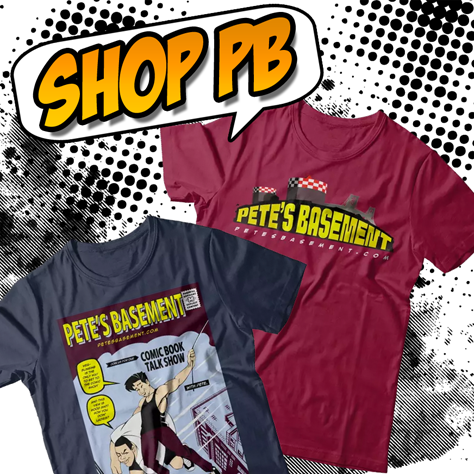 Use Coupon Code LUCKY10 before 3/18 and save money, yo. I'm about that life. Walmart is also offering pre-order bonuses. 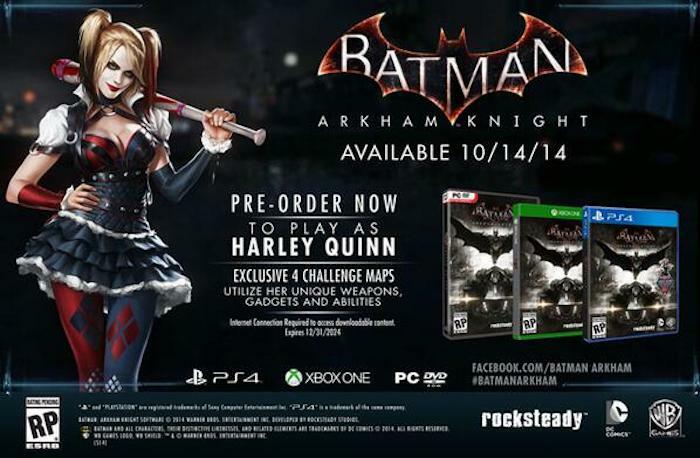 It includes the Harley Quinn as a playable character with the 4 exclusive challenge maps in addition to an exclusive Batmobile in-game proto-type! It's uniquely designed and includes exclusive gameplay features. That's pretty rad. Check it on XBOX One, and PS4. Walmart doesn't seem to be offering the pre-order bonus for PC. That prototype Batmobile looks hot. My birthday is this month, anyone wanna get me a PS4 off my WISHLIST so I can get this game? No? Well, I tried. More posted on this dope new game as it comes in!